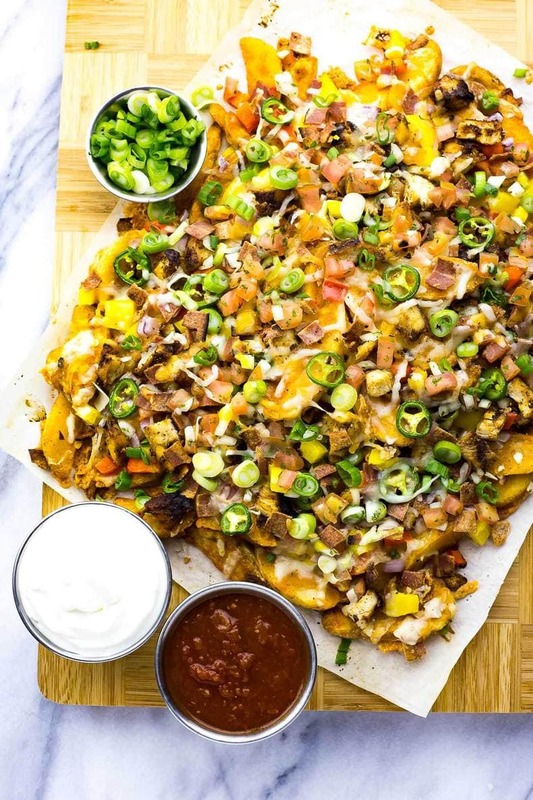 These 30-Minute Irish Nachos are such a fun way to celebrate St. Patrick's Day, and they're made super easy thanks to frozen potato wedges! Preheat oven to 425 and cook potato wedges according to package directions. Meanwhile, cook raw diced chicken in a frying pan or BBQ the whole breast flipping halfway through. Cut into 1/2-inch pieces once cooled if BBQ-ing. Or just make it easy on yourself and use leftover chicken! While wedges are baking, prepare rest of toppings and fry turkey bacon. Remove wedges from oven and top with cheese, chicken and all other toppings except for tomatoes. Bake another 5-10 minutes until cheese is melted. Remove from oven and top with tomatoes, sour cream, salsa, cilantro, etc. Serve immediately and enjoy!